Five Simple Ways to Make Your Home Safer in 2017 | Hupy and Abraham, S.C. According to the American Psychological Association (APA), most Americans never achieve their New Year’s resolutions and many of us can’t even make it to the end of January. The APA suggests this is largely because we have a tendency to set unrealistic goals for ourselves, essentially setting ourselves up for failure. But, resolutions don’t have to be complex to have a positive impact on our lives. Considering more than 18,000 Americans die every year from injuries that take place in the home, one simple resolution may be to take some time in the New Year to make your home safer. To help, here are five simple ways to do just that in 2017! Install a functional carbon monoxide detector in your home. For only about $40, you can protect your family from carbon monoxide. Secure your home from burglary. One simple, low-cost way to do this is to put a wooden dowel or metal bar in front of sliding doors and windows so they cannot be pried open. Put light timers around your garage, walkways and steps. Falls are the number one cause of injuries in the home. By lighting up areas around your home at dusk and nighttime you can help protect your friends and family from slips and trips. 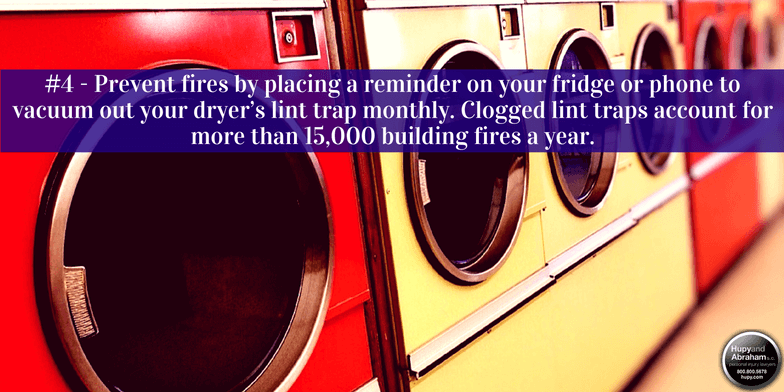 Prevent fires by placing a reminder on your fridge or phone to vacuum out your dryer’s lint trap monthly. According to the U.S. Fire Administration, clogged lint traps account for more than 15,000 building fires a year. Keep medicines and household chemicals in their original, child-resistant containers, because poisoning is the second leading cause of home injury or death. If you mix your own cleaners, make sure they are clearly labeled and kept out of reach of children. There’s no reason to start the New Year with a goal you won’t keep. So, make a list of your resolutions, put them in a place you’ll see daily and set up a reasonable schedule to complete them. All of us at Hupy and Abraham hope you have a safe and happy 2017. But in the event that you or a loved one are injured due to the negligent actions of another, the attorneys at Hupy and Abraham are here to help. Call 800-800-5678 or start a live chat 24/7 at Hupy.com.